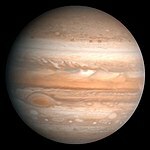 ↑ Scott S. Sheppard, David C. Jewitt, Carolyn Porco Jupiter's outer satellites and Trojans, In: Jupiter. The planet, satellites and magnetosphere. Edited by Fran Bagenal, Timothy E. Dowling, William B. McKinnon. Cambridge planetary science, Vol. 1, Cambridge, UK: Cambridge University Press, ISBN 0-521-81808-7, 2004, p. 263 - 280 Ամբողջական տեքստը (pdf).